A few weeks ago, we gave you the lowdown on eco-chic wedding invitations and were particularly intrigued by a series of "plantable" invites from Winnipeg-based online supplier Botanical PaperWorks. As it turns out, this environmentally-friendly company carries an entire line of plantable wedding stationary embedded with flower seeds - from invitations, to favours, to DIY paper, to confetti! 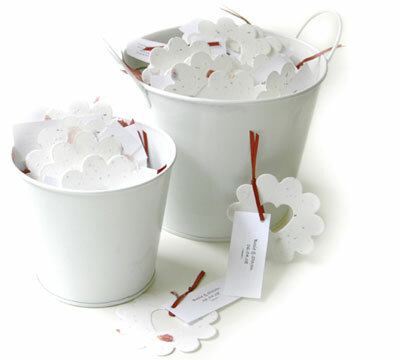 The "Bucket of Love" comes with 50 or 100 seed-embedded card favours, which sprout colourful wildflowers when planted. The plantable cards come in a wide variety of colours, and each one comes with an attached tag personalized with the newlyweds' names. Currently, the 50-card Bucket of Love sells for $78.00, and the 100-card is $138.00. "Share & Blossom" plantable favours are shaped like tiny flower pots, and come in a wide variety of colours. Like all of Botanical PaperWorks' seeded stationary, these favours come with planting instructions, and can be printed with a personalized message. Currently, these 4 1/4 x 3 1/ inch favours are $0.99 each, with envelopes available for $0.28 each. The "Love Tag Seeded Favor and Placecard" provides a dual purpose for your Big Day - guests can take home the plantable "Love" favour while the tag can be used as a placecard, personalized with a message to guests, as well as their names and table number. Currently, the 4 x 5 inch favour/card combos are $2.50 each, with envelopes available for $0.47 each. If you've been paying attention so far, you've probably noticed that one thing all of these items have in common is their 'magic' paper! If you're seeking a do-it-yourself solution, Botanical PaperWorks also offers their seeded stationary straight up, in a variety of different colours, sizes, and prices. Be sure to also check out the instructions on how to print, plant and mail their plantable paper. Guests who feel a bit weird about burying a picture of the bride and groom in the ground will be happy to know that the photo portion detaches from this plantable invitation - so they can still see the happy couple while they watch their love grow! Currently, the 5 x 7 inch "Flourish" seeded wedding invitation ranges from $5.00 each for orders of 200 or more to $6.00 each for smaller orders of 1-49. 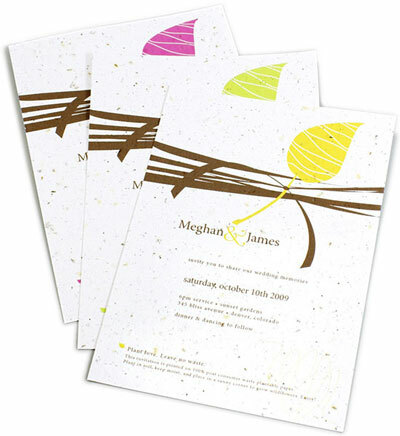 The lovely leaf motif on this invite further reflects the environmentally-friendly concept behind plantable invitations. 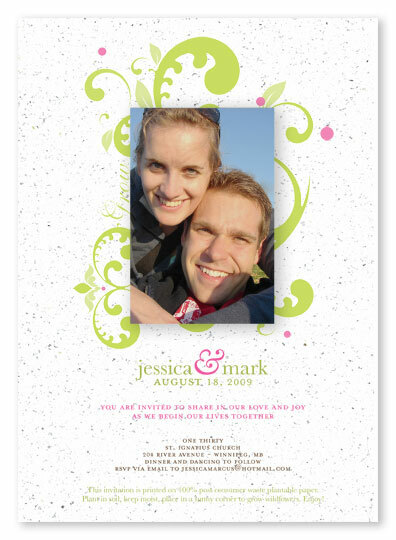 Made with 100% post-consumer waste, the "Embrace" design is also printed on coordinating RSVP cards and Thank You cards. Leaf colour choices include blue, pink, orange, and yellow. Current pricing ranges from $4.50 per invite for orders of 200+ invitations to $5.50 each for orders of 1-49. These "Classic Rectangle" invitations are an elegant and modern option, featuring printed vellum affixed to handmade paper and a wax seal or ribbon to adorn the top. Your choice of matching vellum, handmade, or machine-made envelopes is also available. 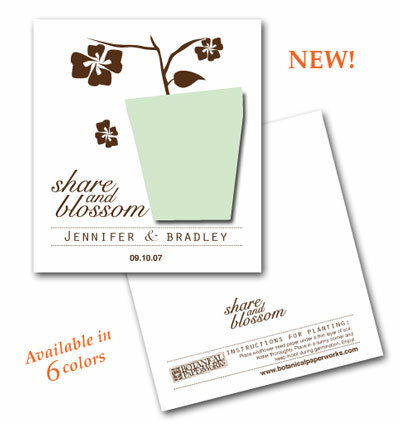 Currently at $3.95 each, these plantable invitations are fully-customizable - you get to choose the paper and ink colour as well as font and embellishment styles. 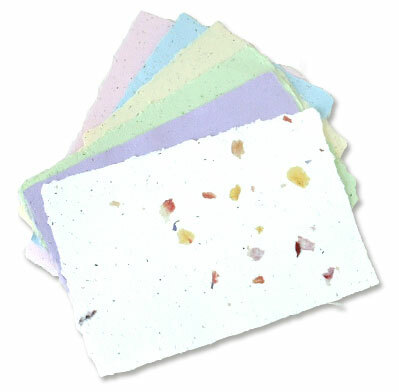 Featured in the Winter 2009 issue of Martha Stewart Weddings, the Five Petal Plantable Confetti comes in white, cream, green, yellow, pink, lavender, blue, or petalled white. Scattered them everywhere during your outdoor wedding and the following Spring a carpet of wildflowers will mark the occasion! 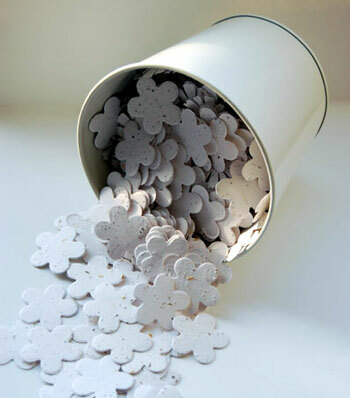 Packages of approximately 300 plantable petals, which can be packaged at home in tiny pouches for guests to toss, are $29.95, and white confetti buckets are $3.95 each. 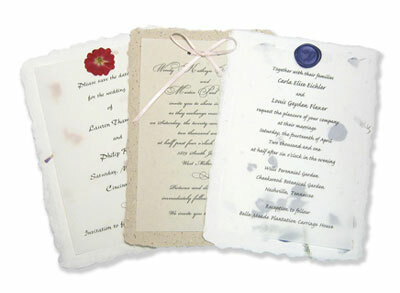 Be sure to also check out our other articles on eco-friendly wedding stationary!